The unit does not go into Night mode even the lights are on. Is the displayed set to “off”?→Press the button, etc. Is the setting for the image quality correct?→Verify the screen settings. If this doest not solve the problem, turn the power supply for the unit OFF and then ON again.If the problem continues, contact your dealer. When the monitor has small spots or bright points. This is not a failure of the unit. →This is a specific phenomenon to liquid crystal displays. 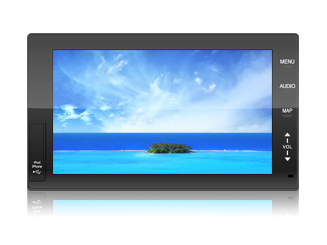 LCDs are builtwith highly accurate technologies and have 99.99% or higher effective pixels. However sometimes pixels may fail at a rate of 0.01% or less, or some pixels may get “stuck” on a steady color. When the image is not clear. Are the display brightness adjusted correctly? →Refer to Page 19 to adjust the brightness of the display. Sound is generated but no image is displayed (while the vehicle is parked). Is the parking brake on? Has the RCA cable connected correctly? A desired audio image is not displayed. Is not video cable connected except device that you want to play? →connect a video cable to device that you want to play. When the sound is coming out of only one of the speakers. Is the sound volume adjusted properly? →Adjust the volume on the Front/Rear and Right/Left speaker. The sound of the portable audio device is not output through the speaker. Is the power of the portable audio device on? →Turn the portable audio device on. Is the music on the portable audio device playing? →Be sure that the portable audio device is playing the music. Is a mini-plug cable having resistance being used? No power to the unit. Is it in the pause or the mute-ON state? →Disable the pause state or set to the mute-OFF state. Sound skipping or noise occurs. There is an electromagnetic-wave generator such as cellular phone near the unit or its electrical lines. →Keep the electromagnetic-wave generator such as cellular phone away from the unit and the wiring of the unit. If noise cannot be eliminated due to the wiring harness of the car, consult your dealer. Playing VBR (Variable Bit Rate) files may cause sound skipping. Some operations are not executable. Some operations are not executable in particular modes. →Read the operating instructions carefully and cancel mode. If the unit is still out of order, consult your dealer. Bluetooth device cannot be connected to the unit. Is the Bluetooth device is able to be used with the unit? iPod is not being correctly operated. Remove the iPod from the unit and reconnect the iPod after resetting the iPod main body. For the iPod resetting method, refer to the iPod user manual. Copyright 2013 E-Lead All Rights Reserved.